A growing body of scientific evidence strongly suggests that feed and feed ingredients may be risk factors for the spread of PEDV at both the domestic and global levels. What a difference a few years makes! Prior to the porcine epidemic diarrhea virus (PEDV) epidemic in 2013-2014 across North America, no one seriously considered feed as a potential vehicle for pathogen transmission. However, there is now a growing body of scientific evidence strongly suggesting that feed and feed ingredients may be risk factors for the spread of PEDV at both the domestic, and the global levels. In addition, research in progress is also starting to evaluate whether other viruses, possibly foreign animal disease pathogens that are currently not native to North America, i.e. foot and mouth disease, African swine fever, to name a few may also have the ability to “travel the world” via contaminated feed. Should these theories prove to be true (and I believe they will), global agriculture will need to experience a significant paradigm shift and there will be a requirement to develop protocols of “feed biosecurity” across all agricultural industries, including the processing of grain, the manufacturing feed and feed ingredients, in order to deliver a safe product to our ruminant and monogastric livestock populations. Please remember that the companion animal profession already experienced a very similar issue; how many of pets became sick or died following the consumption of food imported from China that was contaminated with melamine? What are the solutions? How do we manage this risk? Unfortunately, at this time answers are not readily available; however, we are hard at work. 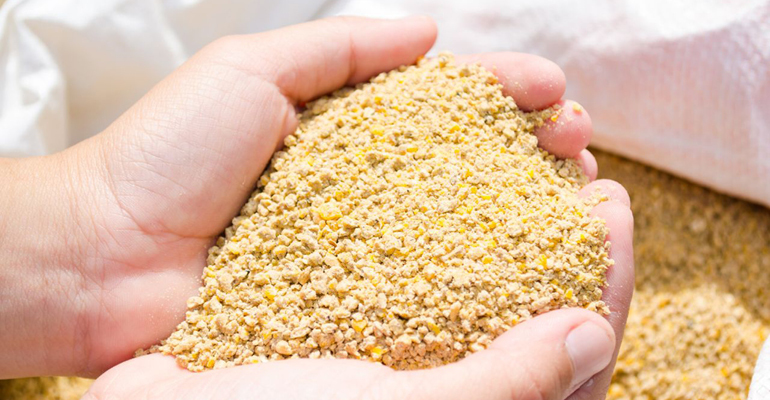 The critical first step would be to conduct properly designed studies to identify feed ingredients that have the ability to promote pathogen survival. Next, studies need to be conducted that simulate the transport of products from China to the U.S. under conditions that represent actual transport times and environmental conditions. Based on these data, I would envision that the next steps could involve several options, such as the adaptation of biosecurity practices at the level of the feed mill and the delivery truck, along with the application of mitigants to neutralize any existing viruses and thereby protect feed as it moves from place to place. Finally, and perhaps most importantly, the entire mindset regarding ingredient sourcing may need to experience a dramatic paradigm shift. Specifically, we need to start making decisions on the sourcing of ingredients from countries that are free of foreign animal diseases. In other words, we need to make decisions that are based on health, instead of than price. Now, I understand these ideas are easy to talk about, but challenging to implement. However, I believe that once our industry is provided with scientifically-sound data on the identity of actual risk and how to manage it, we will put our best foot forward and let science dictate the decision-making, not economics and politics. In the end, I foresee a market-driven response to this issue that will demand a high-level of safety across the products we feed our animals along with a high level of scrutiny across our processes and protocols. I would also be hopeful that our governmental agencies would step up, providing leadership and resources to facilitate ongoing research and the application of the outcomes at the high-risk sites, such as countries of origin, ports of entry and feed mills across the country. This strategic, collaborative approach is our best chance at changing the concept of feed biosecurity from an oxymoron to a strategic process that is science-based and actually has a chance at protecting U.S. agriculture.